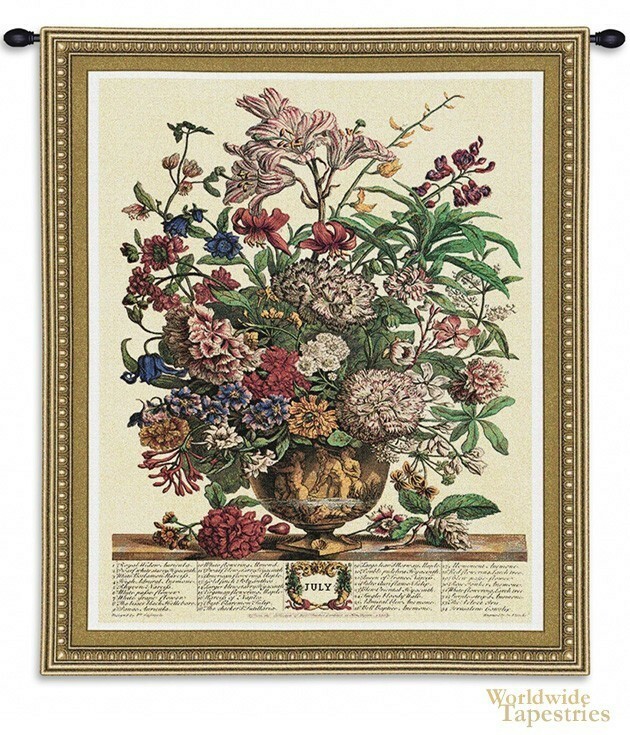 July Botanical shows the beautiful floral work by Robert Furber, a British botanist. A member of the English Society of Gardeners in 1724 to help each other name newly discovered species of flowers, his works focused on beautiful and accurate depictions of flowers. Here in July Botanical, based on the original published in Twelve Months of Flowers in 1730, we see the blooms of mid summer. An array of colors are seen including reds, yellows, pinks, blues among the rich green foliage, in a beautiful arrangement. The details in each flower and bloom is impeccable, as we see the flowers that are abound in mid summer. The flowers are arranged in a golden classical vase, and some blooms are seen strewn onto the bench below. An emblem showing "July" is seen below, as are a list of the flowers seen in this work. July Botanical tapestry is backed with lining and tunnel for easy hanging. Note: tapestry rod, where pictured, are not included in the price.